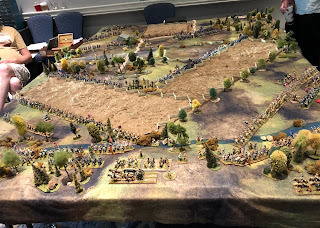 I ran this 28mm ACW game at Nashcon this month. Scenario - The scenario was from "Fire and Fury Regimental - The fight comes to Sheridan". The Federal center must hold out against furious Confederate assaults at the Battle of Stones River. 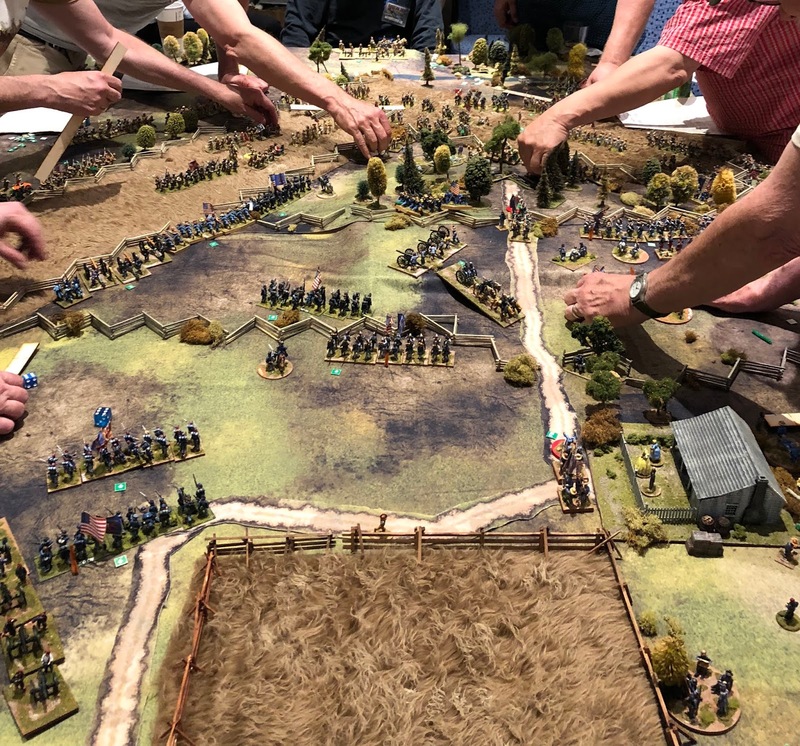 This scenario makes a great convention game since all the troops start on the table-top and the action starts from the first turn and all players are in the fight quickly. 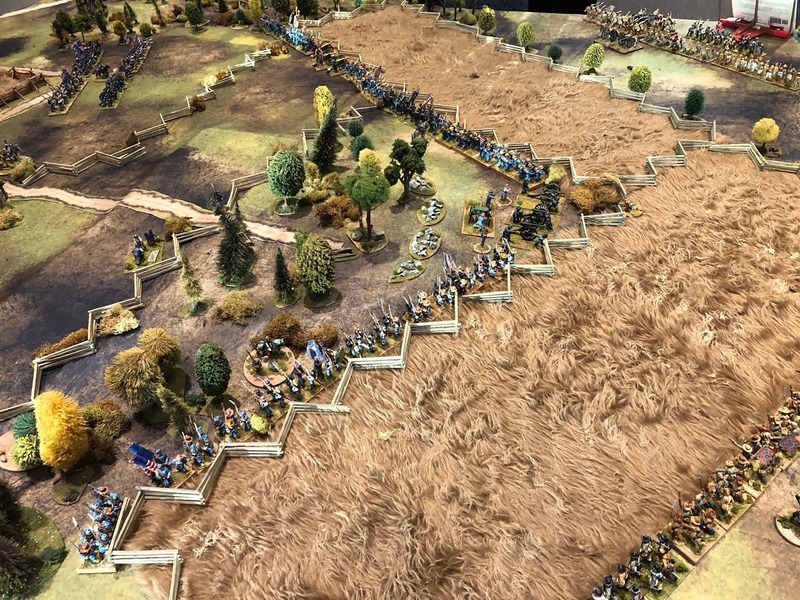 This is a fun scenario with some Green USA troops, some Elite CSA troops, sharpshooters and lots of 1862 poor and eclectic small arms and artillery. 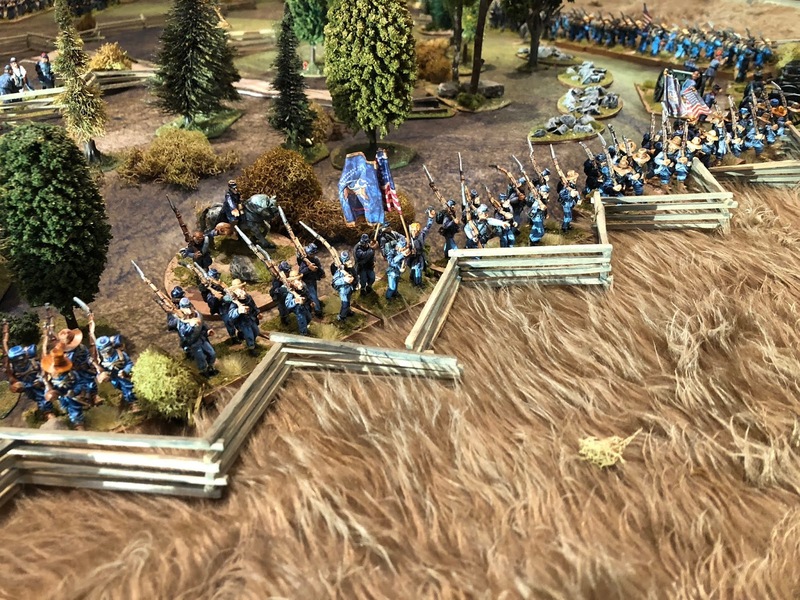 Rules - My favorite set of tactical ACW rules is John Hill's "Johnny Reb". I use the GDW version, often called "Johnny Reb 2". The game is fairly old school with lots of charts, but I run the charts as the GM and let the players focus on the tactics. We had several experienced players from the "Johnny Con" group at Nashcon, as well as some new players and I think everyone had a great time. I really enjoy playing old rules and I think there is a "retro-gaming" renaissance at the moment! Figures - The guides are mainly 28mm ACW Gamer, Dixon, Old Glory, Perry plastics and Sash & Saber. I challenged myself to paint more this year since I was short about 120 Confederates and used Nashcon as the deadline. This is my motivational technique! I logged many hours at the gaming table in March, April and May getting ready for the convention. I typically listen to music, or podcasts while I paint. I find shows too distracting! How about you? I'll probably pick an even bigger battle next year, or something with cavalry (which I don't have) to challenge myself to paint! I normally elect Western Theater scenarios and I'm thinking about doing "Spring Hill 1864". Terrain - I used two terrain mats, cheap stereo-foam hills underneath, x-ray film streams, a Perry farm house, painted teddy bear fur fields, HO trees and scratch built fences. 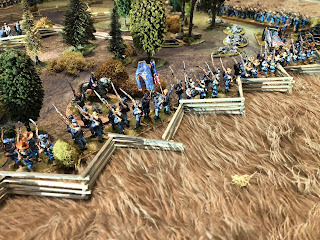 Game - The scenario saw the CSA troops quickly assaulting the Federal line. The breached the Federal left and were making steady progress only to be halted by a second Federal line and a Federal counterattack on the CSA right flank. We called the game around turn 6 as it was getting late and declared a "marginal Union victory". Softening up the Federals with some shot and shell! The Feral center near the corn fields. and take the wooded hill behind the their line. View from the Federal line. You have to paint the limbers and caissons, right? What a great looking game Cory. 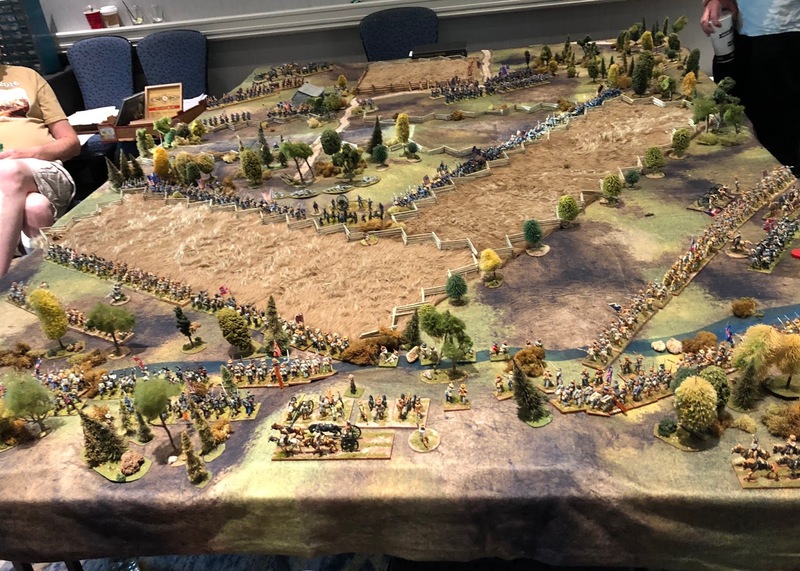 A splendid game on a spectacular terrain!